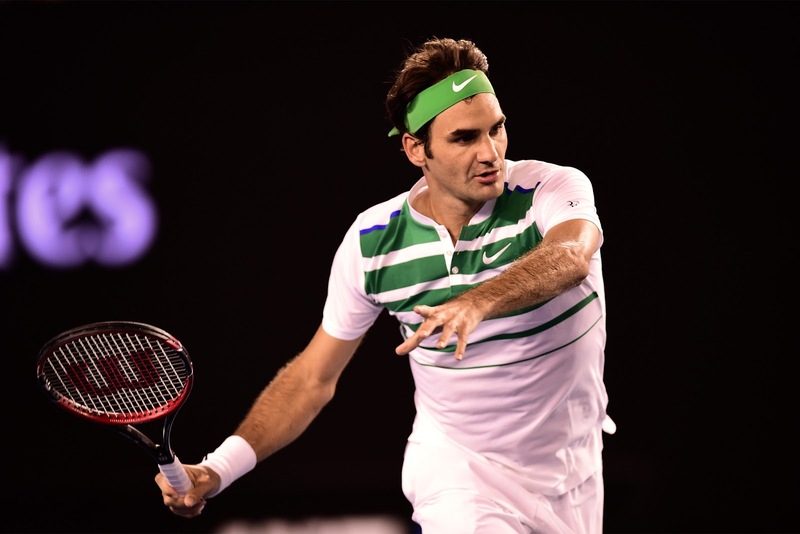 Roger Federer climbed into rarefied territory on a rainy Friday at the Australian Open. With a 6-4, 3-6, 6-1, 6-4 third-round win over 27th seed Grigor Dimitrov in Rod Laver Arena, the No. 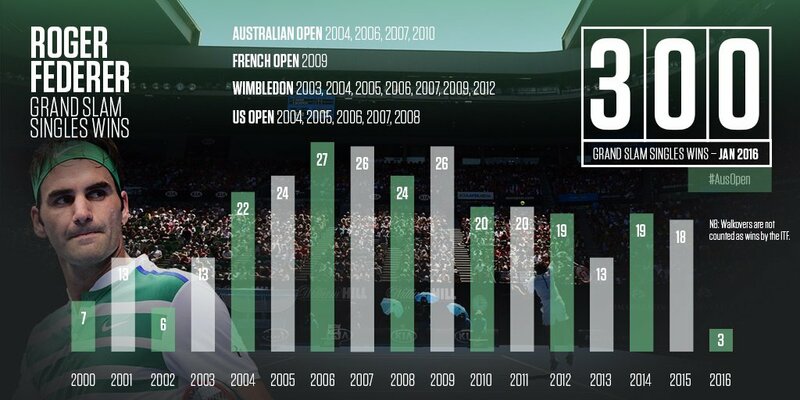 3 seed clinched the 300th Grand Slam match win of his storied career, becoming the first man to reach the milestone. Only Martina Navratilova (306) stands in front of him. Despite being the first man to notch 300 match wins at Grand Slam tournaments, Federer found success to be a long and winding journey. “I made a lot of mistakes,” said Federer as he reflected on his early career, one which saw him upset Pete Sampras on the Wimbledon Centre Court at age 19. 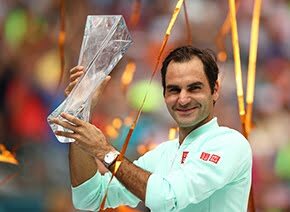 Following that unexpected win, the ponytailed wunderkind needed to wait two more years before fulfilling his immense promise and capturing his first Grand Slam title on the same court. 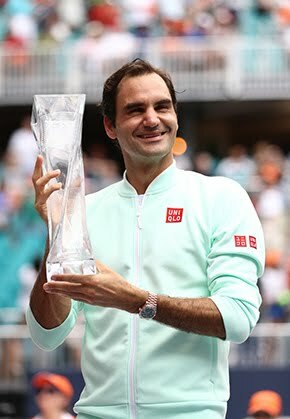 “I wish I could have maybe been tougher when I was younger in practice, but I guess that's just how it needed to be,” said Federer, who was eliminated in the first round of 2003 Roland Garros by underdog Luis Horna before finally putting it all together weeks later at SW19. “It needed to be genius or horrible. I needed to have that wide spectrum. I needed to make mistakes to become the player I am today. The final win over Mark Philippoussis was a long time coming for the then-21 year old, but Federer stressed the important of patience for young guns looking to take that step today. “There's more professional tennis players than ever,” he said. “The depth is greater. Talent takes you only so far. You have got to be patient. You can't expect to win Slams at 16, 17, 18 anymore these days, or skyrocket through the rankings, unless you're out of this world. Federer stressed the importance of being surrounded by quality people during that process. “I had unbelievable coaching, support team, parents, wife, and everybody around me throughout,” Federer noted. Now an elder statesman of the game at age 34, Federer is no doubt thrilled with how his career has unfolded. But there is a wistful tone in his voice when he thinks back to the time when he was a raw, long-haired kid, ready to take on the world. The 48-minute first set went in Federer’s favour behind a service break at 3-all, the only interruption the opening, then closing, of Rod Laver Arena’s retractable roof due to rain. But the Bulgarian Dimitrov, who after three straight-sets losses took his first set off Federer in the Brisbane quarter-finals earlier this month, would get another to level the match at a set apiece, his aggressive play paying dividends against the 17-time Slam champ. Federer didn’t wait long to assert himself in the third set, breaks coming in the second and sixth games for a 5-1 advantage. A game later he was ahead two sets to one. A forehand error from Dimitrov at 2-all, 30/40 in the fourth and final set would give Federer a seemingly insurmountable lead, and the Swiss went on to clinch the contest in two hours and 40 minutes. He finished with 47 winners, including 13 aces. 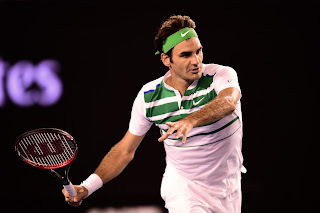 “That was my goal, to react quickly after the second set because I struggled a little bit,” said Federer. “But then found my way back, then was able to take charge of the match. It was important. Conditions, again, were very different indoors than they were against Dolgopolov in the second round. Even night session plays different. Federer advances to play No. 15 seed David Goffin of Belgium, a 6-1, 3-6, 7-6(2), 7-5 winner over No. 19 seed Dominic Thiem of Austria. The 25-year-old Goffin is through to the fourth round of a major for the third time, having also reached the last 16 at 2012 Roland Garros (as a qualifier) and 2015 Wimbledon.